I want to continue sharing with you the dolls of the Drake House Museum. All the dolls in this collection are German and this little adorable baby was made by “The King of Doll Makers” Johannes Kestner. Kestner began making dolls in 1805. He (or she) is marked JDK 211 and is 11 inches tall. I think he is just adorable and he exemplifies the uniqueness of the Kestner doll faces. This particular doll originally came in all sorts of sizes from small, like this one, to over two feet tall. This was a very popular face for Kestner. He is entirely made of porcelain or, as referred to by doll collectors, “all bisque.” He has a chubby baby body with bent arms and legs. He has the original Kestner crown sticker on his body. It is great to see the sticker because many children took them off. He has beautiful deep brown glass eyes that are fixed in his head but were probably sleep eyes when he was first purchased. Sleep eyes becoming unfixed are very common in antique dolls. Since so many people do not know how to reset them, they simply glue or plaster them in and the doll’s eyes no longer open and close. He has a mohair wig which is most likely original. It does look a little tattered but mohair is goat hair and looks great when it is new but is notorious difficult to restyle. Mohair is brittle and breaks easily. This explains the unkempt look on so many antique dolls. He is dressed in a long white baby gown which was not his original outfit. He needs to be restrung, as all his stringing has loosened up. He is a great little baby doll. 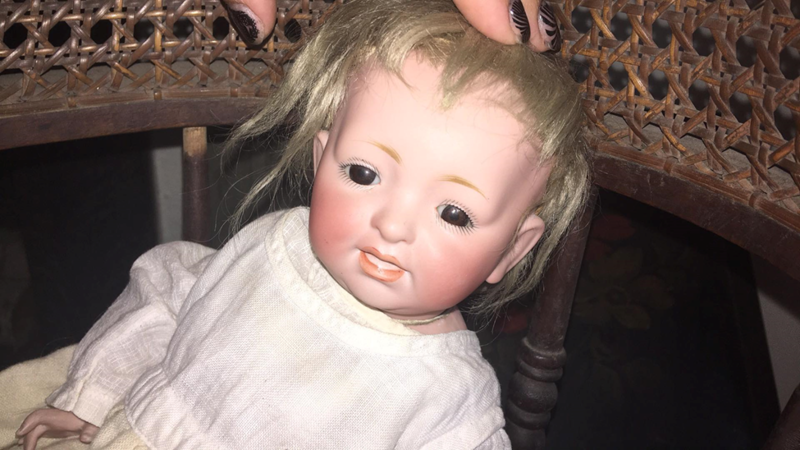 You can see this adorable doll as well as, all the dolls of the Drake House Museum. The Museum is open Sunday 2-4. Beautiful China Doll at the Drake House Museum.